I love bell peppers. You know who else loves bell peppers? Iron Chef's original chairman Takeshi Kaga. When news broke last month that Iron Chef was returning to Japanese TV after a 13-year hiatus, it wasn't known whether or not Kaga would be returning with the show. Turns out, unfortunately, he's apparently not. Instead, actor-singer Hiroshi Tamaki will take on the role of the chairman. He'll be joined by comedian Daisuke Miyagawa, announcer Yurika Mita, and announcer Mizuki Sano. The show's basic structure won't change from the structure that made the first series a hit. Because the original host's image is so strong, Tamaki wondered if he could be silly enough, Sanspo reports. He said he does want to succeed Kaga, however. Online in Japan, the attitude towards this assembled cast seems mixed, with some calling this group "questionable". Many are saying that Tamaki is simply too young and too handsome for the chairman gig. What's more, he doesn't seem to be much of a gourmet food lover! Kaga was such a larger than life, over the top figure that he could really sell the show—and biting bell peppers. He's like an anime character brought to life. The decision to go with Tamaki could change Iron Chef, as he seems to be your typical handsome Japanese dude without unique features per se that makes him stand out. 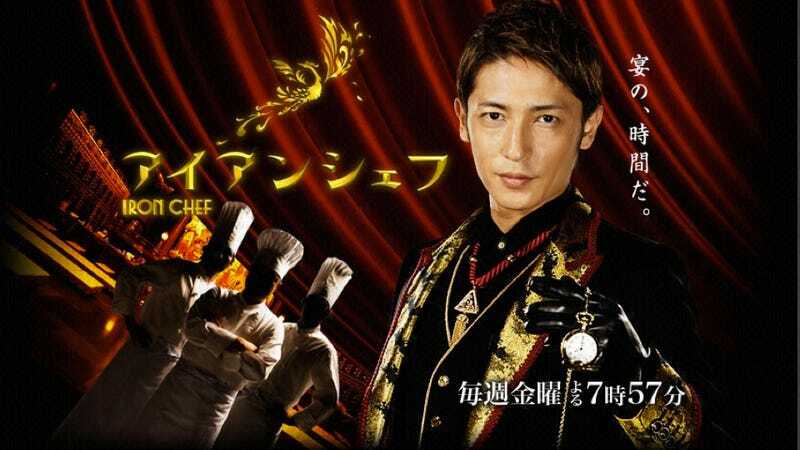 Then again, Tamaki could pull it off and make the new Iron Chef as popular as the old. It won't be until October 26, when the show debuts in Japan, that we find out. Stay tuned.